When installing DuoGen or D400, the minimum requirement is that the rating of the cable chosen should be equal to the maximum current (amperes) that the machines can generate. Note that power (watts) = volt X amps so the maximum current generated by a 24 volt D400 will be half that produced by a 12 D400. A 48 volt turbine at full output will produce one quarter of the current of a 12 volt machine. However the actual power delivered remains the same in each case. Wire size is important because when current flows through a resistance (which is measured in ohms) voltage is lost. This is referred to as voltage drop. The greater the current and the higher the resistance in the circuit the larger the magnitude of the voltage drop. All cables have a certain level of electrical resistance, but using a larger cross sectional area of cable results in a lower resistance for a given cable length. Minimising resistance in the circuit improves efficiency by reducing voltage drop. However for practical reasons when installing turbines cable selection is usually a trade-off. The greatest electrical losses only occur when the turbine is producing the highest output, and this only occurs in high winds which are relatively infrequent. As long as the cable selected is rated to safely carry the peak current, it is not generally considered practical or economic to fit very heavy cable which provides for the lowest possible loss in these rarely encountered conditions. Therefore most cable sizing recommendations are designed to deliver on acceptable overall transmission efficiency of around 95% where the recommended cable sizes are used electrical losses will be minimal in the operating conditions, which prevail for most of the time. Note that poorly made connections and corroded connections can introduce very high resistances into a circuit and are probably the most frequent cause of poor system performance. Tinned cable is recommended as this offers superior corrosion resistance to untinned copper wire, particularly in the marine environment. All connections should be securely made using terminal block or the joints can be soldered for extra security. Quality crimp connectors closed with a proper crimp tool are another option, but beware of badly crimped joints. Note also that the quality of the insulation affects the rating of cable. PVC insulated cable with a temperature rating of 75°C is typically used. 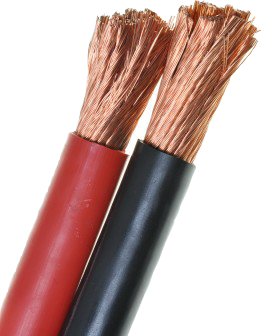 Cable insulated with butyl rubber has a higher temperature rating and can therefore carry higher currents. On a yacht cable is normally run from the lazaret area at the stern, forward to the batteries. Cable should be arranged the run to ensure that it is unlikely to be accidentally pulled or strained. Also avoid placing it where heavy or sharp objects may be dropped onto the cable which could damage the insulation. As with all power cables it is preferable to route turbine output cables separately and away from aerial and sat nav cables. If this is not practicable as a minimum avoid bundling power cables tightly together with signal cables. When considering which cable size to use make an assessment of the total length of the cable run in metres. Remember to include the height of any mounting tower or tube. Then multiply this by two, which gives the total circuit length i.e. positive to load and back to negative. Use this figure to select a minimum wire size from the tables below. The following table shows voltage drop in millivolts per ampere of current, per metre for some popular cable sizes. Note there are 1,000 millivolts to one volt DC. You can use this table to assess the relative efficiency of different cable options. To work through a typical example assuming a 12V D400 wind generator mounted at the stern of typical cruising yacht. Cable run turbine to batteries, 9 metres. Total circuit length i.e. positive to load negative to generator is 18 metres. Maximum probable charging current is 50 amps (approx. 650 watts). Assuming 10 mm2 cable, and maximum turbine output the volt drop would be 4.5 x 50 x 18 = 4050 Millivolt or 4.05 VDC, equivalent to about 33% of the total power being generated. However at more typical turbine outputs of say 5 amps the loss through the same cabling would be only 0.4 VDC or 3.3% of power generated. Referring to wire sizing table you will see that 10 mm2 is actually the minimum recommended for D400 and this length of cable run. If we calculate the same example using 16 mm2 cable, the volt drop figures becomes 2.4 VDC and 0.24 VDC respectively. This example illustrates that in typical operating conditions electrical losses with both wire sizes are acceptable. However, the system would achieve higher overall transmission efficiencies with the 16 mm2 cable.